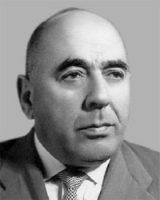 Isaak Yakovich Berkovich (born December 28, 1902, Kiev, Ukraine – died January 5, 1972, Kiev, Ukraine) was a Soviet composer, pianist and teacher. He was a member of the National Union of Ukrainian Composers. Being the author of teaching aids School of Piano Playing, Berkovich made a significant contribution to piano pedagogy. Isaak Berkovich devoted all his life to music, more than one generation of musicians studied on his teaching aids. Isaak Berkovich was born in Kiev into a family of a watchmaker. In 1920 the future composer entered the Kiev Conservatory (nowadays – Petro Tchaikovsky National Music Academy of Ukraine); there he studied piano with Professor Vladimir Pukhalsky and composition and music theory with Professor Boris Lyatoshinsky. His pedagogical work began in 1922 and continued throughout his life. Simultaneously with his studies, Berkovich began teaching. Up to 1930 he worked as a piano teacher at Kiev Music School №6. In 1925 Berkovich graduated from the Kyiv Conservatory. By this time he had already been the author of a rather large number of works, mostly written for small musicians. In 1925-1941 he worked as a teacher at the Kiev Music College and the Kiev Evening Conservatory. From1933 until 1941 Berkovich worked as an assistant, since 1947 he was an associate professor, in 1969 he held the position of a professor at the Kiev Conservatory. In 1938 Berkovich became a member of the National Union of Ukrainian Composers. Berkovich was actively engaged in pedagogical work along with composer activity. Mostly his work was aimed at creating piano pedagogical repertoire. Berkovich had a number of publications. Special attention was paid to piano works focused on those who are studying at children music schools. These piano works include etudes, pieces, arrangements of folk songs, other authors’ songs and numerous adaptations of piano works. Berkovich’s creative legacy includes works for violin and cello; there are also orchestral works. But most of the works were written for his favourite instrument - piano. Works for Piano and String Orchestra – Three Concertos (1961, 1963, 1968), Variations on the Theme of Paganini (1967), Trio (1928); Two Sonatas for Piano (1922, 1941), Three Sonatinas for Piano (1952), Thirty Easy Pieces (1938), Thirty-five Etudes (1950), A Collection of Polyphonic Pieces (1950), Variations on Folk Themes (1963), Twenty-four Preludes (1965), School of Piano Playing (1960), Cycles of Pedagogical Pieces and Ensembles (1938-1966), etc. Berkovich also composed for the folk instruments orchestra (suite-1964), for violin and piano, cello and piano, domra and piano, for voice and piano. Berkovich wrote romance Thought (Duma) based on the poem by Taras Shevchenko and songs for children. VARIATIONS on the theme of the Belarusian folk song "PEREPELOCHKA"
SINGING LESSON VI part of the suite "Hello School!"